The Chinook salmon is an important keystone species of the U.S. Pacific Northwest. It is a vital food source for a diversity of wildlife, including orca whales, bears, seals, and large birds of prey. 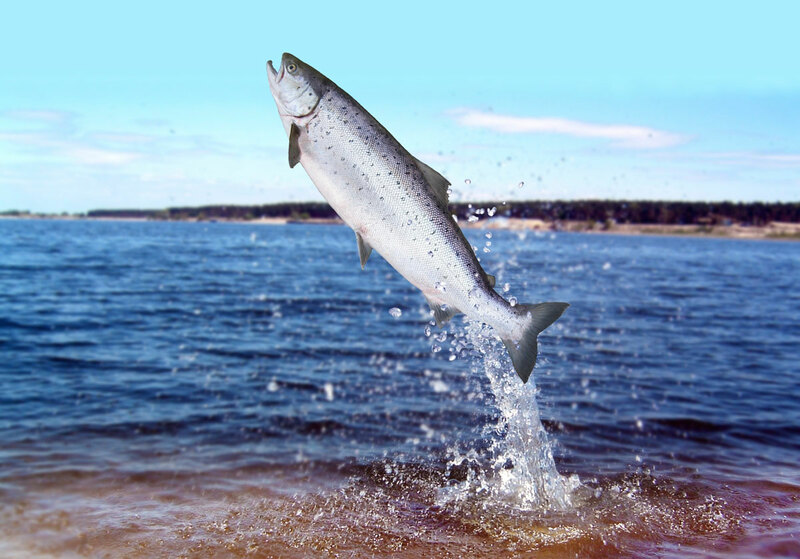 Chinook salmon is also prized by people who harvest salmon both commercially and for sport. Chinook are the largest Pacific salmon species. On average, these fish are 3 feet long and approximately 30 pounds, but some individuals can grow to over 5 feet long and 110 pounds! Chinook salmon live about three to seven years. Juvenile salmon stay in freshwater habitat for the first year or so, before moving to the estuaries and then the open ocean. Estuaries provide a lot of food and nutrients to the developing salmon. The fish will spend approximately two to four years feeding in the ocean before returning to the spawning grounds to breed and die. The Chinook Salmon is on the U.S. Endangered Species List. The Sacramento River winter-run population in California is classified as endangered wherever it is found. Other naturally spawned populations in California, Idaho, Oregon, and Washington are classified as threatened. Why the Chinook and other Pacific Northwest salmon have declined is no mystery. The causes are known as “the four H’s”: harvest, habitat, hatcheries, and hydroelectric power. Harvest refers to the overfishing of these species by commercial fishing interests. Habitat refers to the degradation of habitat, usually by pollutants or sediment in the water that make it uninhabitable by the salmon or their eggs. Captive-bred hatchery fish, released in the waterways used by native fish, compete and interbreed with the natives, weakening their stocks. Hydroelectric dams have had perhaps the largest impact, blocking migration routes and changing the quality, quantity, rate of flow, and temperature of the water in rivers, lakes, and tributary streams that once supported tens of millions of salmon. Protection of Chinook salmon is crucial to maintain healthy Pacific Northwest ecosystems and to provide a delicious food source for years to come. On July 14-16, Catie and I had the fortune of working alongside Justin Meyers of Myers Imaging Company and Erik Urdahl of Urdahl Photo as they completed their shoot of the South Coast for our Wild Rivers Photo Project. The Wild Rivers Coast Photo Project is a Travel Oregon funded project to get professional images of Oregon’s South Coast. These images will be used for tourism marketing purposes and will focus on outdoor recreation, natural scenery, in-town hotspots, and local wildlife. Justin and Erik had come down mid-June to shoot the areas of Bandon and Port Orford and on this particular weekend they were focusing their shoot on Gold Beach and Brookings. In total they will be shooting approximately 200 photos for this project. We met up with Justin, Erik, and Dave Lacey of South Coast Tours LLC at 6:45am on Friday. They started their shoot doing an early morning paddle-boarding session at Secret Beach, and the day just took off from there. Throughout the day, we visited spots like the Chetco River’s Elephant Rock, the Brookings port, and various restaurants. We concluded the day with photographs of sunset at Samuel Boardman State Park. On Saturday, Justin and Erik took photos of Catie and I paddleboarding on Hunter Creek near Gold Beach. We then went tidepooling at Harris Beach State Park, followed by some ocean fishing and eventually a few visits to breweries and other businesses. The eventful day was concluded with late afternoon paddle-boarding at Secret Beach once again. On Sunday, I joined Justin up in Port Orford as he took a few street biking photos along the Elk River. The photos will be used for free by communities along the Wild Rivers Coast to help market to visitors. The community official destination management organization (DMO) will be able to access images through a service provided by the Oregon Coast Visitor Association (OCVA) who will manage the images. To see more of Justin’s and Erik’s work, check out their websites at http://www.myersic.com/ and http://urdahlphoto.com/. Winchester Bay is located where the Umpqua River meets the Pacific Ocean, just north of the Oregon Dunes National Recreation Area. While the timber, agriculture, and fishing industries have been a dominant contributor to the town’s economy throughout the 1900s, today, tourism is increasingly becoming more prominent. One thing in particular that is bringing in people is the great fishing opportunities. With its unique location, Winchester Bay is an ideal region for lake, river, and ocean fishing. In the past, Winchester Bay has faced strict fishing regulations due to decreases in the salmon population. Regulations peaked in 2008 when all ocean salmon fishing was prohibited, leading to a $22 million in statewide losses to businesses that support recreational fishing with most of those losses occurring in coastal towns. In addition to this, commercial fishing businesses were projected to lose $23 million due to the closure. Fortunately for Winchester and the rest of the Oregon coast, sport salmon fishing was given the go-ahead by the Pacific Fishery management Council in early April 2017 under certain restrictions. To view a detailed account on season starting dates, areas open, and catch limits, click here. From rock fish, to ling cod, to both the chinook and coho salmon, and even sturgeon, Winchester Bay is not lacking in fish species. There are a number of fishing charters that make full use of these unique fishing opportunities. Charters can be found on the Oregon Coast Visitor Association’s website. Crabbing is allowed year round in bays, estuaries, tide pools, piers, and jetties, with a license. So bring your crab pots and fishing lines over to Winchester Bay for a good time!